What are the dimensions of the knobs? The diameter of each knob is given in the details for that knob on the website. Additionally it is possible to shop by size on the website. 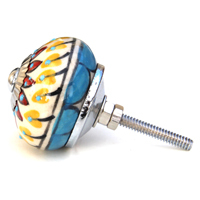 The smallest diameter knob we sell is 30mm and the largest is 40mm. Please don't hesitate to contact us if you have any queries about size. 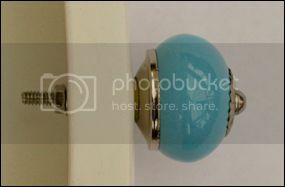 How long will my door knobs take to arrive? If you place an order on a working day before noon we will despatch your goods the same day (stock levels allowing), otherwise it will be the next working day. We use Royal Mail to despatch your goods, this will usually take between 1 and 3 days. What is the maximum thickness of door/drawer Knobbles and Bobbles door knobs can be used on? The bolt supplied with each door knob will fit a maximum door thickness of 2.5cm. We do have some longer bolts that will fit a maximum door thickness of 3.5cm that are available for some of our designs. Please contact us if you have any queries. Will knobs bought at different times be exactly the same as each other? Probably not! The goods are hand made in India and there are often differences in the shade of colour, pattern, knob dimensions etc between one 'batch' and the next. Rather like buying wallpaper or fabric, it is advisable to buy all the knobs needed in one go so that we can ensure the knobs sent are well matched. 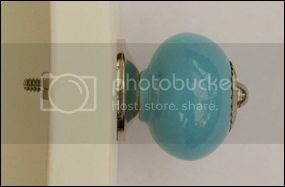 How best do I clean the ceramic door knobs? We recommend using a soft damp cloth to clean the door knobs. What is the most popular shape and colour? We don't know! It varies so much. Lots of people are really into the shabby chic look right now, so we get lots of orders for one each of a large number of different shapes and colours. We'd love to get to see the end results - send us some pictures folks! We all have our favourites though, I love the bright multi-coloured knobs. I have them on my bedside table and they make me smile. I have my knobs, how do I fit them? 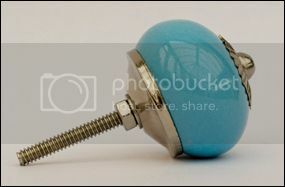 Each knob is supplied with the ceramic knob itself, a metal bolt, two nuts and two washers. 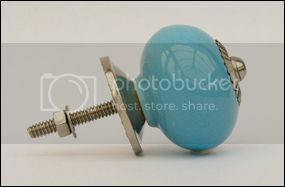 There are two ways of fitting the knob, both ways are very quick and very easy. Which you choose is just personal preference. If there isn't a pre-existing hole in the drawer or door to which you are going to fit the knob, first drill a hole. A 5.5mm diameter drill bit is ideal. Remove the nuts and washers from the bolt. Ensure that the flange is facing the knob and then push the bolt through the drilled hole in your drawer until the flange is flush with the drawer front. Put one of the washers and one nut over the bolt and tighten until the knob is fixed firmly, take care not to overtighten. If there isn't a pre-existing hole in the drawer or door to which you are going to fit the knob, first drill a hole. Unscrew the nuts and remove both washers from the bolt. Turn the flange round so that it will allow the ceramic knob to stand proud of the door/drawer. Thread one washer and one nut onto the bolt and tighten to secure the flange in place. Push the bolt through the drilled hole in your drawer until the flange is flush with the drawer front. Put the remaining washer and nut over the bolt and tighten the nut until the knob is fixed snugly. Oh no! Please contact us by email at info@knobblesandbobbles.com or give us a ring on 07746 357625. We'd love to hear from you. We want you to be completely happy with your purchase. If, however, you wish to return your goods please notify us by email within 14 days of receipt. We will then advise further. Please ensure that the parcel is wrapped in such a way as the goods are returned to us in a saleable condition. We will then refund the full amount you paid, to the card you used when purchasing. It is the responsibility of the customer to pay for the return for 'change of heart' reasons. For partial returns, if the value of the retained items falls below £45 and free postage had been applied to the original order, postage charges for the retained items will be deducted from the refund. Our Terms and Conditions supersede the details above, please see our Terms and Conditions for full details.